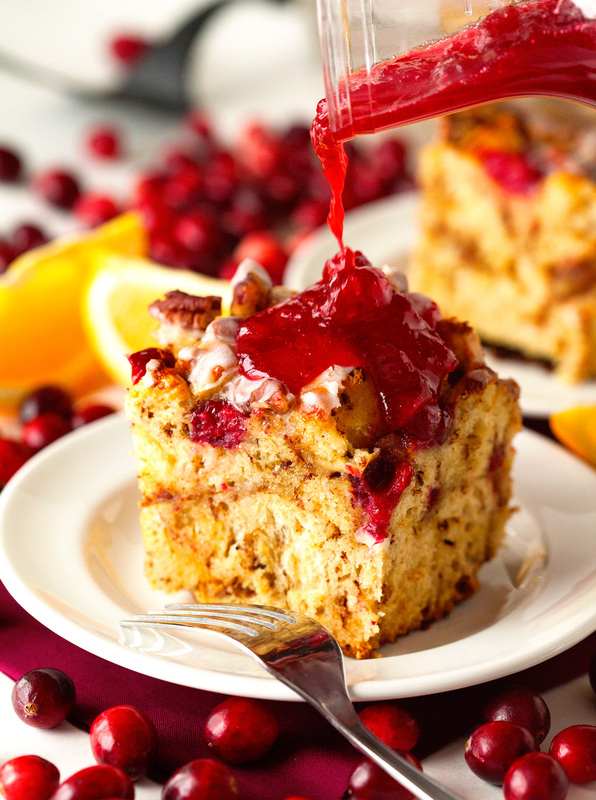 A Cinnamon Roll French Toast Bake that’s been stuffed with Fresh Cranberries and is served with a Homemade Cranberry Syrup or Sauce. 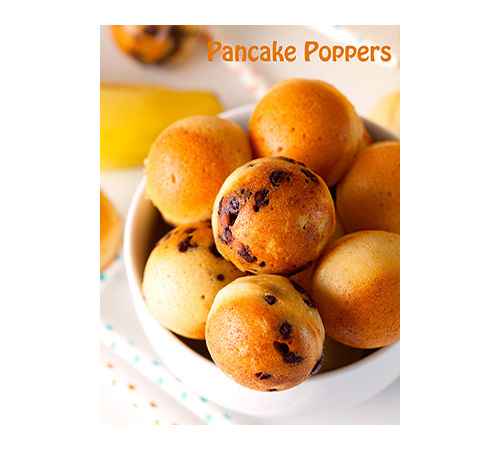 This makes for the perfect holiday breakfast! I am guessing it’s appropriate to say Happy Monday! Given the fact that most of us are working only a short week and that the long weekend is already in sight. As if that wasn’t enough, we’re also on the brink of devouring one of the best meals the year has to offer. Thanksgiving is great that way. Having full hearts and happy bellies. One of the best holidays for sure. It also lends itself to long, comfortable, and special breakfasts. 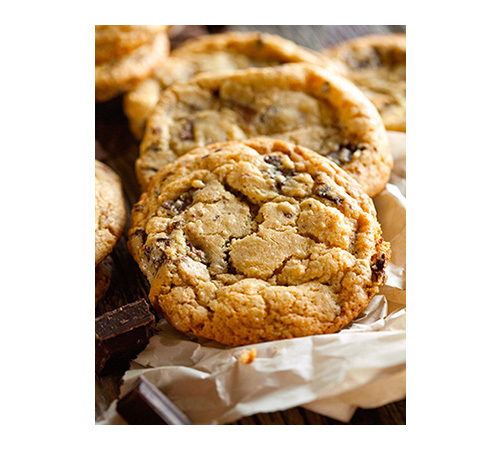 Whether you’re looking for a last-minute breakfast idea that you can throw together for your loved ones or something filling after you’ve hunted down the best deals in the stores, this bake has your name written all over it. 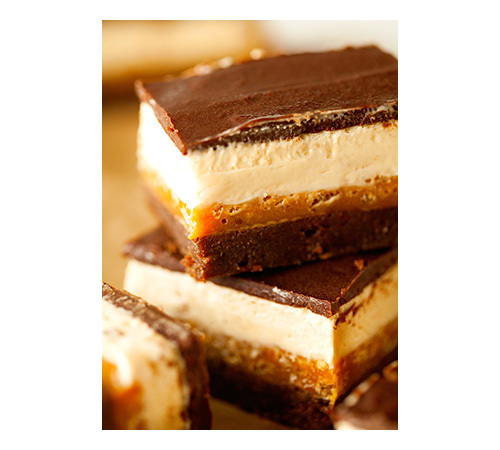 You might even want to look ahead and add a scrumptious family pleaser to your Christmas menu. Believe me, this one is what traditions and memories are made out of. Literally. 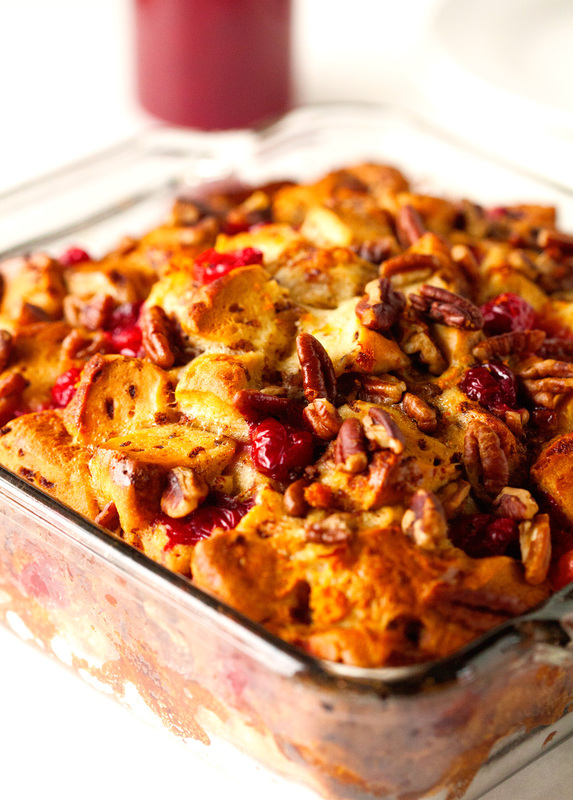 Even though I’ve only made this the morning of, I am certain that you could prepare this French toast bake the night before and pop it into the oven the next morning. Unless you have an extra 10 minutes… because that’s all the prep time you need. 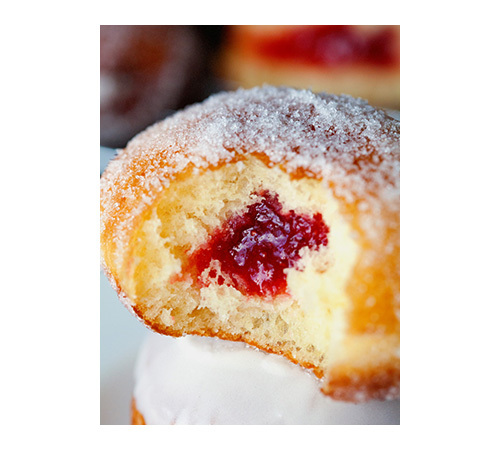 Just thought I’d let you know – I always have more fun reading blog posts when I know that something delectable takes basically no work to make. Especially on lazy mornings or super busy ones, likes Thanksgiving or Christmas morning ;). 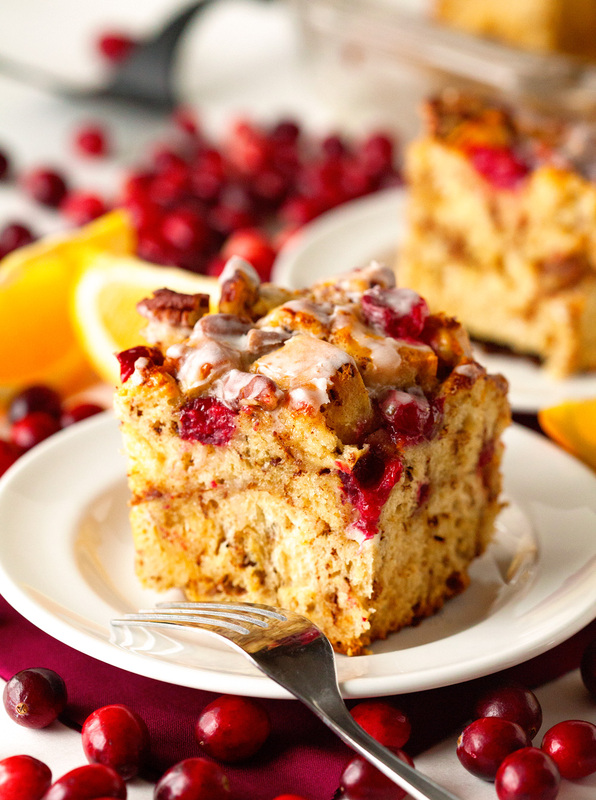 If you have a thing for cinnamon rolls, cranberries, and a taste of holidays, there’s no question you should give this a go. I kind of threw this together on a whim, using all the flavors I can’t get enough of this time of year. And we were more than pleased with the result. It was so good that I had to top it with a healthy amount of cranberry sauce. I’ve always loved making my own cranberry sauce/syrup. This morning I was in the mood for sauce, which means cooking your syrup for an additional 5 minutes or so. 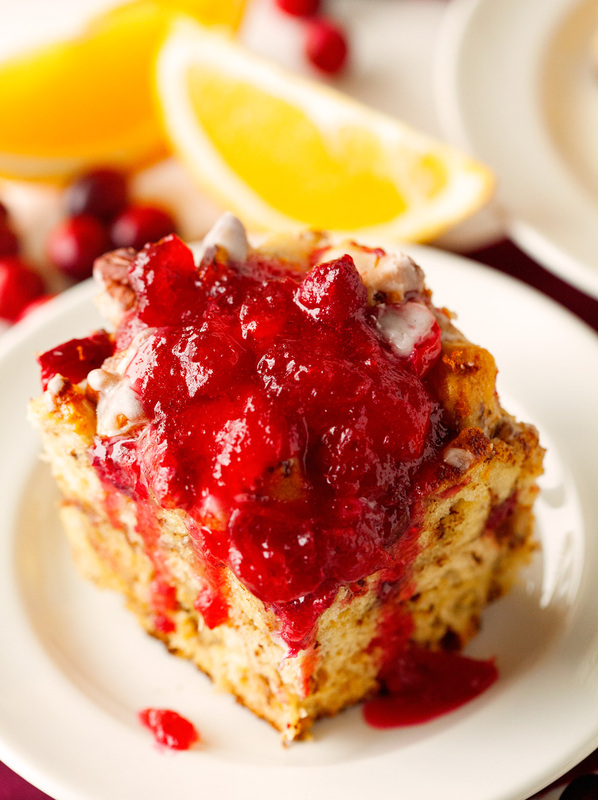 If you want simple cranberry syrup, the recipe below will be perfect. Just reduce the total cooking time by a couple of minutes or until you’ve reached the desired consistency. Also, every piece will contain just the right amount of cranberries. The warm juice will burst in your mouth and marry with the pieces of cinnamon rolls and general French toast awesomeness. Get your forks ready to sink into your tall, thick and wonderfully moist piece. This is definitely the recipe that got me beyond excited for the weeks ahead. Weee! Make it a grateful one, friends. Now and always. Xoxo. 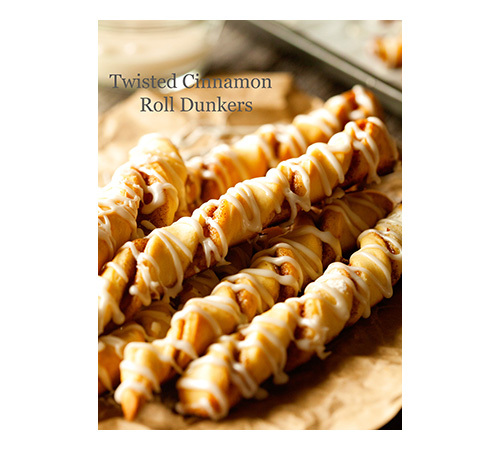 Need to please a crowd, your family or just your taste buds? 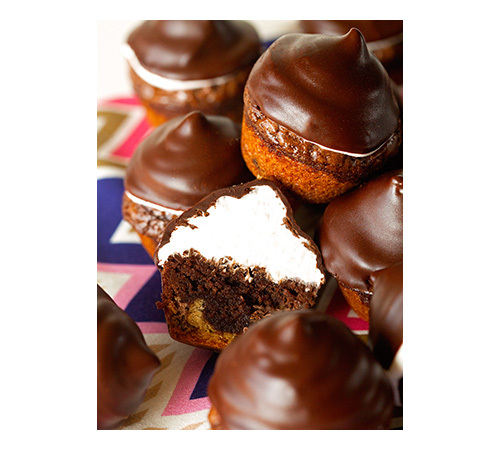 You’ve found the right recipe – this is a new family favorite. Happy Holidays, Everyone! 1. Place butter into an 8-x-8-inch baking dish. 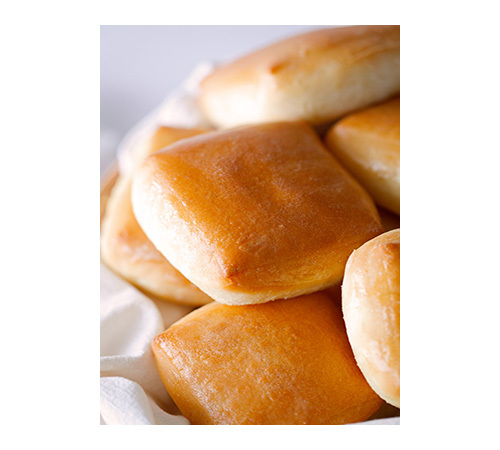 Place butter inside and put into the oven until melted. Remove from the oven and make sure the baking dish is evenly coated with the butter. Set aside. 2. Remove the cinnamon rolls from the tube and cut each roll into 8 pieces. In a medium bowl, whisk together eggs, milk, pinch of salt, vanilla and cinnamon. 3. Fill baking dish with half of the cinnamon roll pieces. Cover with half of the fresh cranberries and pour 1/3 of the egg liquid on top. 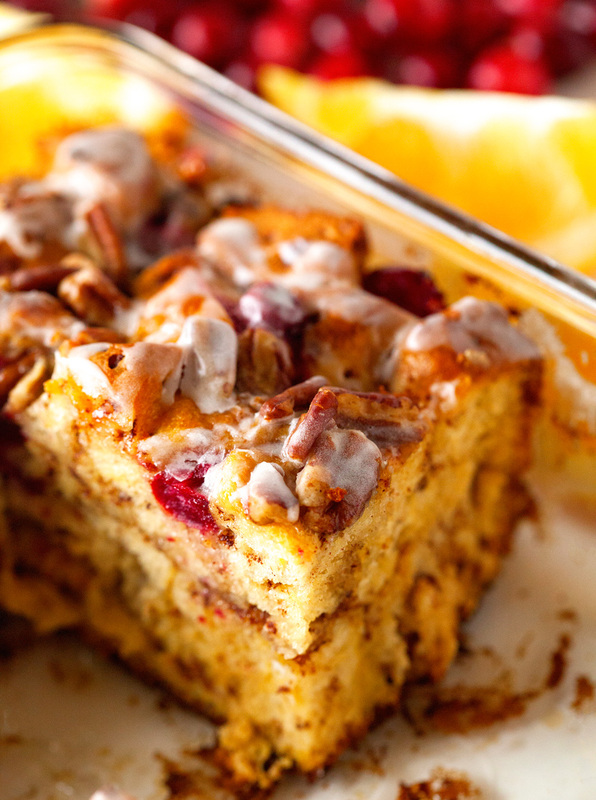 Cover with the remaining cinnamon roll pieces and cranberries and pour the remaining egg liquid over the top. Sprinkle with the pecans and grate the zest of 1 lemon over the bake, optional. Place in the oven and bake for 30-35 minutes (if the bake browns too quickly, cover it with aluminum foil for the remaining 5-10 minutes). 4. Meanwhile, combine the water, sugar, and cranberries in a small saucepan to prepare the syrup/sauce. Cook the mixture for 10 minutes if you prefer syrup or for 15-20 minutes for cranberry sauce. 5. When the casserole has finished baking, remove from the oven and immediately spread icing (if using) over the top. Cut into pieces and serve with warm cranberry syrup/sauce. Enjoy! French Toast is best enjoyed on the same day, but can be stored in the fridge for up to 2 days. Gorgeous! 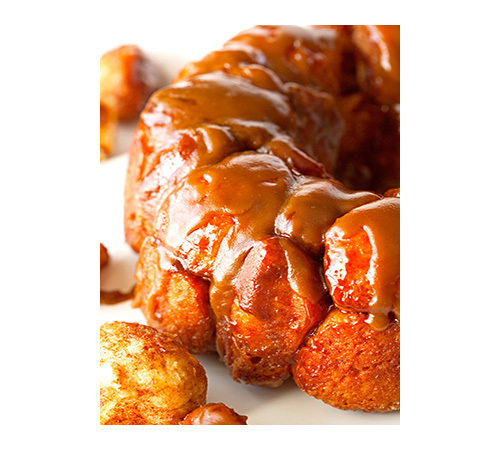 What a great way to spice up an already delicious french toast bake! 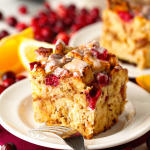 I love this time of year with all things cranberry! 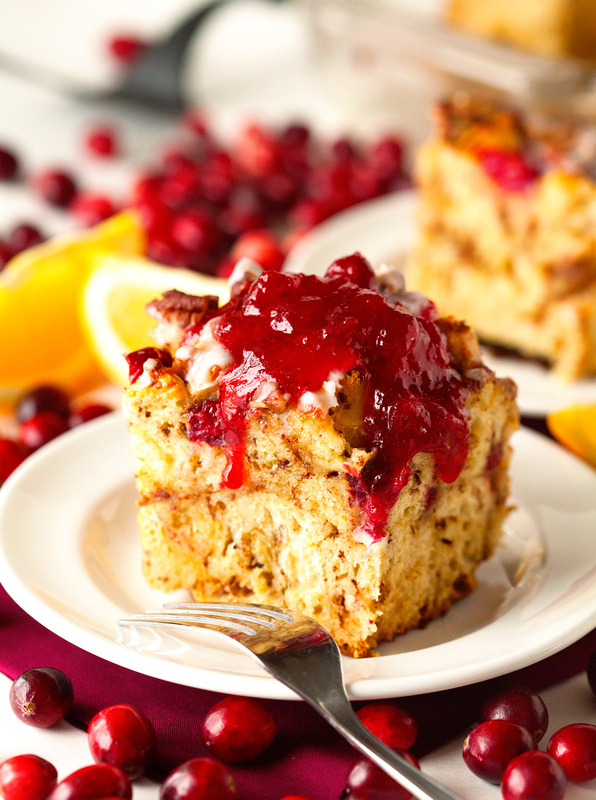 French toast bakes are always delicious, but with that cranberry sauce? Oh my, over the top YUM. And I really liked your description of Thanksgiving: having full hearts and happy bellies. I so agree! Happy Tuesday! I think that must be appropriate too, since it’s nearly Thursday, right? 🙂 I don’t think nearly enough about breakfast on Thanksgiving Day. This looks so delish, maybe I should consider this as the morning’s main star! This is soooo beautiful. Pinned!